Eight-division world title winner and Filipino boxing sensation Manny Pacquiao returns to the ring this weekend to face Argentinian knockout artist Lucas Matthysse in a bout between two elite but aging boxing stars looking to maintain relevancy as world championship contenders and favorites among boxing betting fans. The bout will pit two of the top 10 welterweights in the world against each other according to Ring Magazine. Additionally, Matthysse will be defending his World Boxing Association (WBA) regular welterweight title, a secondary championship belt of minor importance. Pacquiao-Matthysse takes place on July 15 (July 14 in the United States) at the Axiata Arena in Kuala Lumpur, Malaysia. The bout will be streamed live in the U.S. on ESPN+ with undercard coverage beginning at 9 p.m. ET. Can Pacquiao Still Compete with Top Fighters? One of the most popular and revered fighters in the sport of boxing, Pacquiao’s best days as a fighter are clearly behind him. The 39-year-old is coming off a controversial loss to Jeff Horn and will not have been inside a boxing ring in over a year when he meets Matthysse on fight night in Malaysia. While Pacquiao (59-7-2, 38 KOs) probably deserved the decision over Horn in his last fight, it was clear from the moment the fight started that Pacquiao was older and slower than he had ever been before. Whether his performance was due to advanced age or simply the stress of working as a sitting senator in the Philippines, Pacquiao’s punches didn’t seem to connect with the same ferocious intention they once employed. There are questions leading up to this bout against Matthysse as to whether Pacquiao is still one of the very best fighters in the sport. Regardless, even a Pacquiao at least eight years removed from his best days in boxing is still a formidable welterweight weapon capable of winning a world title against the right opponent. Against Matthysse, Pacquiao will be fighting without Hall of Fame trainer Freddie Roach in his corner for the first time in 17 years. Pacquiao fired Roach after the Matthysse bout was announced in order to hire best friend and longtime assistant Buboy Fernandez to the same role. No one knows what impact the change in trainers might have to Pacquiao on fight night. Still, Pacquiao is currently the No. 6 ranked welterweight according to Ring Magazine and No. 5 per the Transnational Boxing Rankings Board (TBRB), so it’s clear most fight observers still consider him one of the best 147-pound fighters in the world right now. Is Matthysse Really a Top Welterweight? Matthysse is four years junior to Pacquiao, but hasn’t been considered much more than a step above fringe contender status for over five years now. Matthysse (39-4, 36 KOs) was once the most feared junior welterweight in the sport until he was unceremoniously dumped via unanimous decision by Danny Garcia in a 140-pound unification bout back in 2013. Garcia, an excellent counterpuncher, was just too accurate a puncher for Matthysse. After the loss, Matthysse seemed on course to recover his 140-pound wreckingball status by notching three straight wins over some pretty solid competition, the best being a majority decision triumph over rugged Russian brawler Ruslan Provodnikov in 2015. But Matthysse was shockingly knocked out by Viktor Postol for a vacant 140-pound title just a few months later, and some wondered after the bout if he’d ever be seen inside a boxing ring again. Matthysse resurfaced in 2017 as a welterweight. He knocked out two straight opponents in the new division, but neither men had very impressive credentials going into the fights. Still, Matthysse’s performances have been on par with what was expected of the former champion, so some consider him a legitimate welterweight contender until it’s proven otherwise. Matthysse is ranked No. 8 at welterweight per Ring Magazine, but he is not recognized as a top 10 welterweight by the TBRB. According to boxing’s top bookmakers, Pacquiao is the close but clear favorite to defeat Matthysse. Karamba lists Pacquiao at -238 and Matthysse at +165, and other top bookmakers are posting the same or similar pricing options. Historically, pretty much any version of Pacquiao would be favored to match up nicely against a fighter like Matthysse. While Matthysse is a hard puncher and a capable boxer, he’s never been close to the same level of fighter as Pacquiao, and the way he approaches offense leaves him open to the kinds of clean, crisp counters fasthanded punchers like Pacquiao land with regularity. So long as Pacquiao hasn’t regressed much since losing to Horn last July, he should be able to outfight Matthysse using speed and quickness alone. Pacquiao’s style is all kinds of wrong for Matthysse, so short of suddenly looking very old or some kind of lucky punch, Pacquiao winning the fight is probably the right call. However, with all the questions entering the fight surrounding Pacquiao’s sudden change in trainers as well his overall commitment to the sport in general, Pacquiao is probably priced right. After all, Matthysse’s power gives the underdog a chance to change the course of any fight with a single punch, and Pacquiao is way too close to age 40 to place a wager on without at least some well-reasoned trepidation. Placing a wager on a draw might make the most sense for those seeking a good return on minimal stakes. Ladbrokes has the draw at +2100 and it’s certainly plausible to suggest Pacquiao’s lack of knockout power over the last few years means the fight will probably go the distance and be placed in the hands of the judges. Pacquiao was at least -600 on the outright win market heading into last year’s decision loss to Horn, but judges ended up awarding most of the close rounds to the larger, more active fighter in Horn. It’s possible Matthysse tries to use a similar strategy against Pacquiao, and Pacquiao’s diminishing accuracy as a puncher means the fight could be fairly contested over the course of a 12-round fight. Unlike Horn, Matthysse won’t have the benefit of fighting in front of a hometown crowd, so if the fight goes to the scorecards in a reasonably close fight, Matthysse’s best chance is probably sneaking out of Malaysia with the draw. 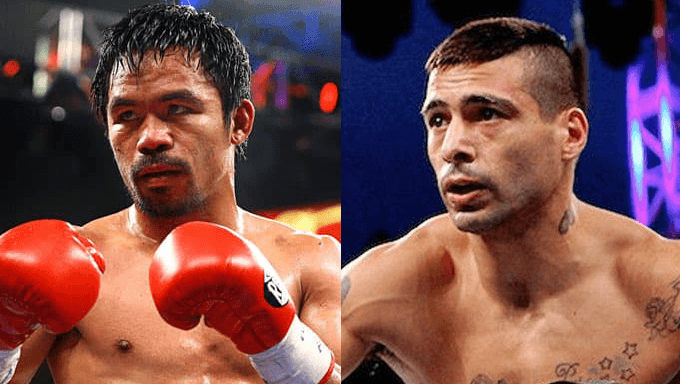 If betting on the rounds market seems more palatable, and you’re convinced Matthysse is a good level below Pacquiao heading into the fight, wagering on Pacquiao to stop Matthysse in one of the last three rounds is probably the best way to bet on a knockout. Pacquiao has tremendously fast hands and an accumulation of punches could lead the referee or Matthysse’s corner to stop the fight if the fight is getting out of hand late. Betfair’s fighter by round market has odds for Pacquiao listed at +2300 for Round 10, +2500 for Round 11 and +2900 for Round 12. The most likely outcome of the fight is a Pacquiao victory by either decision or late stoppage, so make sure you bet accordingly.